A new study published this week takes scientists a step further in their quest to understand how Antarctica’s vast glaciers will contribute to future sea-level rise. 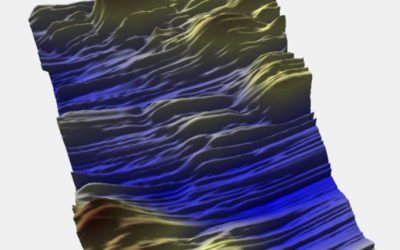 Reporting in the journal Nature Geoscience, scientists from British Antarctic Survey (BAS) and University of Durham describe how a new 3-D map created from radar measurements reveals features in the landscape beneath a vast river of ice, ten times wider than the Rhine*, in the West Antarctic Ice Sheet (WAIS). During 2007, two researchers spent months living and working on the Rutford Ice Stream in temperatures that dropped as low as −30°C. The ice stream moves towards Antarctica’s coast by one metre every day. The science team towed radar equipment back and forth across the ice measuring its thickness, and building up a picture of the landscape beneath. A lubricating mixture of sediment and water beneath the ice assists as it flows towards the ocean, and is sculpted into a series of massive ridges the size of tower blocks and separated by deep furrows. These features ultimately control the flow of the ice stream. 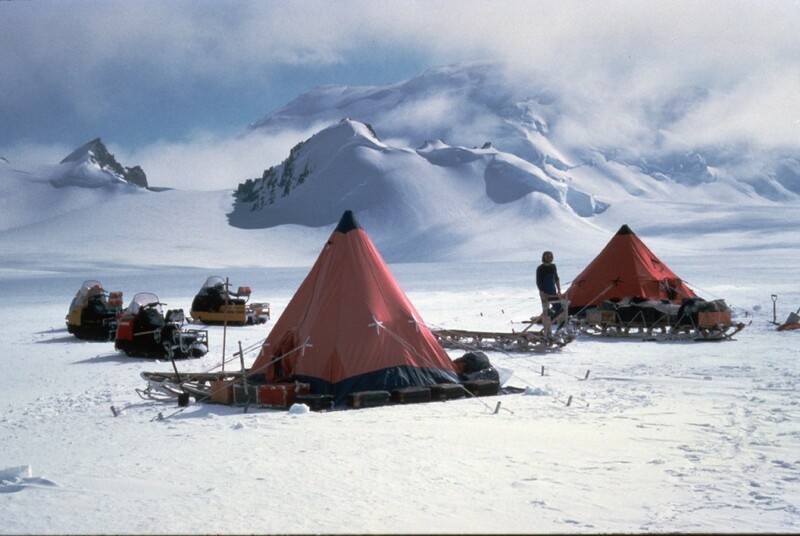 Field training camp on an ice field below Trident Peak, southern Adelaide Island. BAS staff must undergo training and familiaristaion with all equipment to be used in the field, both in Cambridge and on arrival in the Antarctic. Ttwo field units (tent, sledge, skidoos) are shown. British Antarctic Survey scientists have measured the movement and behaviour of the Rutford Ice Stream for the last 25 years. Technological developments in the past 13 years, including satellites, seismic studies and radar, has led to a much greater understanding of what lies beneath Antarctica’s vast ice sheet. 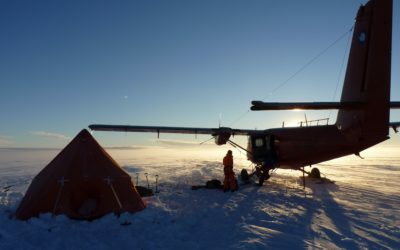 There is still much to learn, but the techniques developed for the study will greatly improve scientists’ capability to measure how the ice sheet may change in the future. Stunning broadcast-quality footage and stills of Antarctica, as well as location maps are available from the BAS Press Office as above. Formation of mega-scale glacial lineations observed beneath a West Antarctic ice stream by E. C. King, R.C. Hindmarsh and C.R. Stokes is published online this week in the journal Nature Geoscience. King and a field assistant spent two months in the ‘deep field’ over 1000km from the nearby BAS Rothera Research Station. They lived under canvas and worked in temperatures often as low at −30°C. Weather permitting they drove their snowmobiles, fitted with radar equipment, 18km up the ice stream — doing this 35 times at 500 metre intervals — clocking up over 1200km in total. The WAIS contains 13% of all the ice on the Antarctic continent. Studying the flow of ice in Antarctica is important to understanding if the ice sheet is in balance. This means that the rate of snowfall (ice accumulated) equals the amount of ice discharged into the sea through glaciers and then ice bergs. The WAIS is not currently in balance. are like gigantic rivers of ice. They can be as much as a few hundred km long, tens of km wide, and they typically move by a metre or more every day. 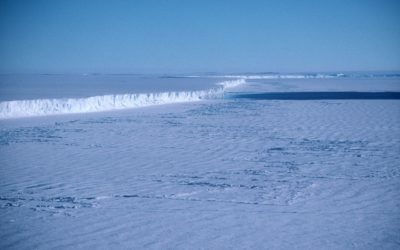 Almost all of the ice from the interior of the Antarctic Ice Sheet is drained towards the sea through these ice streams. As the ice enters the ocean, it forms large floating ice shelves. 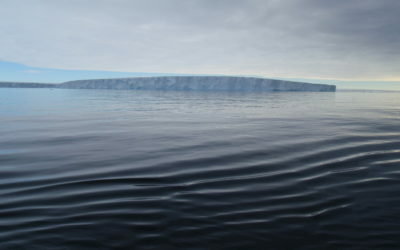 The ice streams can be considered to form the link between the ocean and the more slowly moving ice in the interior of the Antarctic continent. Understanding what controls the flow of ice streams is considered to be of key importance for predicting the future behaviour of the Antarctic ice sheet. is a ‘river of ice’ that is fed by the accumulation of snow. Glaciers drain ice from the mountains to lower levels, where the ice either melts, breaks away into the sea as icebergs, or feeds into an ice shelf. British Antarctic Survey (BAS) is a world leader in research into global environmental issues. With an annual budget of around £45 million, five Antarctic Research Stations, two Royal Research Ships and five aircraft, BAS undertakes an interdisciplinary research programme and plays an active and influential role in Antarctic affairs. BAS has joint research projects with over 40 UK universities and has more than 120 national and international collaborations. It is a component of the Natural Environment Research Council.